Explaining Arizona water—the issues, policies, management strategies, drought, conservation, and stewardship. Our readers include residents, business owners, water wonks, elected officials, and journalists—pretty much anyone who cares about water. As if you needed a good reason to pick up after your dog, here is yet one more: storm drains. 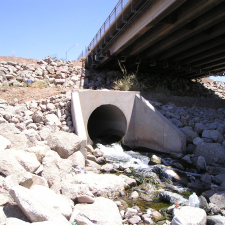 Phoenix, a city of blue skies and sunshine, maintains an 895-mile storm drain system. Desert storms are few but the hard and fast rain rushes across yards, driveways, sidewalks and streets. The torrents carry away oil from dripping cars, goop from open dumpsters, fertilizers from gardens and lawns, bits of tires, trash from parking lots and whatever your dog leaves behind on the sidewalk. The rain rushes into 18,641 catch basins cut out of sidewalks and along the street or, in older parts of town, into grated dry wells often located in parking lots. The water doesn’t go to a treatment plant where it is cleaned, unlike the water from kitchen and shower drains or toilets. Storm water isn’t treated. Most of it empties directly into the Salt River. Some of it flows into washes and retention basins in city parks. The storm drain system is built below the city’s water and sewer lines. Some storm drainpipes are big enough to drive a truck through, while a few are as small as 8-12 inches. Phoenix’s Street Transportation Department is in charge of keeping the system’s pipes clean and free of clutter. For example, the street department operates a fleet of street sweepers equipped with vacuums that pick up street debris so it doesn’t end up in the air or in the storm drains. Each catch basin is marked with a small plaque on the sidewalk that reads “No Dumping Storm Drain.” Most people never notice them, a few use them as convenient spots to dump oil, paint and other bothersome leftovers. To discourage this kind of polluting, the city invites residents to drop off such household hazardous waste once a month in different locations. City inspectors make sure businesses are keeping toxic chemicals off the ground and building managers are keeping their dumpster lids closed. Inspectors also examine liquids coming out of storm drain outflow pipes when it hasn’t been raining. Sometimes the outflow is allowable irrigation water. Other times it’s a polluting substance that inspectors then must track back to the source. Inspectors once discovered water with a high content of lead and copper discharging from an older building’s cooling tower into a storm-drain pipe. Inspectors also found a hotel sending waste juice from its industrial compactor into a storm-drain pipe instead of into the sanitary sewer where it could be treated. Sometimes residents, not inspectors, find the problems. Neighbors reported that a small stone-cutting shop was allowing its wastewater with fine sediment to run into the street and, eventually, down a storm drain. Keeping storm water runoff clean is a community effort that begins long before it rains. Picking up after the dog is a good start. For more information visit the city's website. For 45 years, Arizona Municipal Water Users Association has worked to protect our member cities’ ability to provide assured, safe and sustainable water supplies to their communities. For more water information visit www.amwua.org.